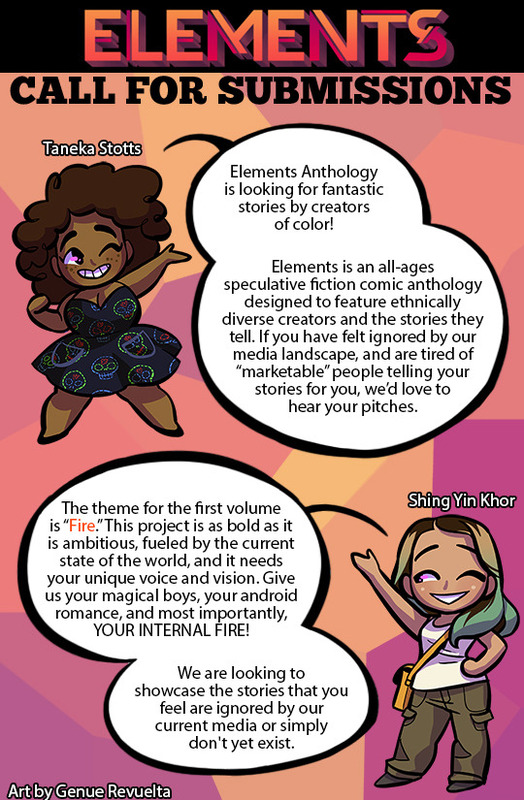 Check out Opportunities for Cartoonist, a tumblr dedicated to posting anthology notifications and updates! Beyond is an anthology of queer sci-fi and fantasy comics. 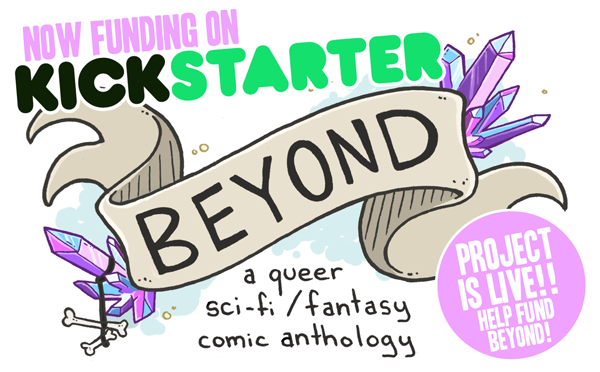 Featuring 18 stories by 26 contributors, Beyond is a 250+ page, black and white, queer comic anthology, full of swashbuckling space pirates, dragon slayers, death-defying astronauts, and monster royalty. Each story celebrates and showcases unquestionably queer characters as they explore the galaxy, mix magic, have renegade adventures, and save the day! The Beyond Anthology was born from a desire to see stories inspired by people like us (queer people with diverse genders and sexualities) slaying dragons, piloting spaceships, getting into trouble, and saving the day—without having to read for their queerness from between the lines. We wanted to see beautiful, heartwarming, and adventurous stories that reflect and celebrate the many facets of gender and sexuality, without having to worry that their queerness would cast them as a villain, a pariah, or turn them into a cautionary tale. Learn more about the Beyond Anthology at BeyondAnthology.com. As Fall is around for most of us and Winter will soon follow, when do you find you get the most work done? I'm a Fall/Winter person personally. It gets darker sooner and I have more of a reason to stay bundled up and by my computer. I go out a lot during the Summer and Spring is just as busy. Since I just have to write, model, and maintain the website, I have a few more freedoms. However, my artist is my roomie and she seems to adhere to the same routine of doing most of her art in the Winter with her heater turned on full blast. Top Cow's annual Talent Hunt is back for a third year, and the company's President and Chief Operating Officer Matt Hawkins is once again looking for budding writers and artists to add their talents to the publisher, a partner studio of Image Comics founded in 1992 by Marc Silvestri. This year's Talent Hunt seeks to hire two writers and two artists to contribute to Top Cow in 2015 or 2016. Writers and artists must not have had previous work at a major publisher. The full rules can be downloaded via this link, along with five sample scripts for artists to use and the submission agreement. Alastair Sterling was the inventor who sparked the robot revolution, and because of his sudden death he didn't see any of it. That is, until he unexpectedly wakes up in a robot body that matches his old one exactly and finds out that 16 years have passed. Brendan Pinsky, Al's former research partner and secret lover, now runs one of the largest robot manufacturers in the country. And Brendan's dearest project, Sulla - a highly advanced robot with a mind copied from Al's - is now living as a teenage girl. O Human Star follows the story of these three coming together as an unconventional family in a not-too-distant future. The Gazette / Full Circle has launched! Hey there. I'm Taneka Stotts, the writer for Full Circle! The artist, Christianne Goudreau, is a full-time working professional at Dark Horse Comics. In our spare time we've been toiling on a little something that we've finally released out into the wild. Full Circle, is a story that mainly follows the journey of Elsa and Rhadi as they travel through the world of Ves. One wants to return home, while the other would rather be anywhere but. So if you enjoy magic, fantasy, and a dash of mystery, come check us out! EDIT: Note to self, never try to write in the shoutbox or type up a post at 6 in the morning XD IT WILL BE FULL OF TYPOS... carry on! I'm just curious if anyone is giving it a shot? Nameless and The Scientist is now on Preorder but you can still read it here! Nameless and the Scientist is a story drawn from timelines imagined, of moments experienced, of lovers. Drawn and written by the stunningly talented Amei Zhao it's a book you'll want for your collection. There's nothing quite like taking a massive, heavy library of beloved books and shrinking it into an e-reader. Amazon, having already accomplished that with its tremendously popular digital book service, is now targeting the comic book market. The company is purchasing Comixology, a digital comic book service with hundreds of millions of users and apps for all of your devices. Comixogy CEO David Steinberger is quite fond of the agreement, the terms of which were not disclosed (we're assuming it's at least $3.50 -- comics these days are awfully expensive). "There is no better home for comixology than Amazon to see this vision through," Steinberger says in the announcement. "Working together, we look to accelerate a new age for comic books and graphic novels." It's just a wild guess, but we're expecting the first such "acceleration" will involve integrating Amazon payments and the Comixology userbase over to Amazon. It's not yet clear if Comixology brand will stand on its own (Amazon already sells single issues and graphic novels on Kindle), but we're asking the company for more, but don't expect to hear much -- the deal hasn't closed just yet, but it's expected to in the next few months. Update: We heard back from Amazon -- join us below for more. As expected, Amazon's only saying so much about its plans for Comixology. We asked whether it's potentially headed to Amazon Prime, and were given a no comment. As far as Kindle integration though, that's a given. "We expect we'll find ways to make both comiXology and Kindle work better together," a rep said. Amazon will retain the comiXology branding, and support the existing apps. A fantasy adventure series following the exploits of the wild young princess, Bold Riley, as she explores the world of The Coin. This series is written by the super talented Leia Weathington and is being published by the fabulous Northwest Press. Check it out and support if you can - or help spread the word! This is the second in the series Cautionary Fables and Fairy Tales. 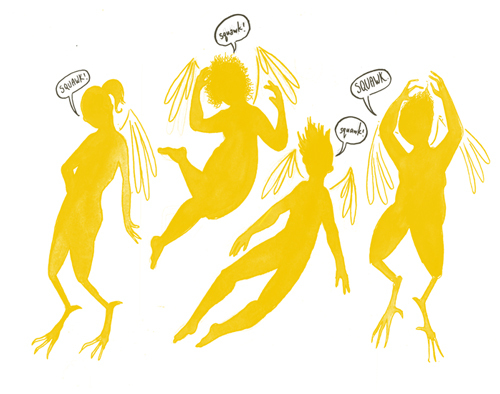 The first was funded two years ago with a collection of European fairytales. This time around we got some great artists and most of the funds are going to paying them for their time.